This is our spin on a burrito. We use corn tortillas and substitute the cheese with nutritional yeast (a vegan ingredient that adds a cheesy taste to the recipe). A family favourite that everyone can enjoy! In a large bowl, add the black beans, chicken and season with the W&T Fajiata Mix. Using a fork (or potato masher) coarsely mash the beans. Add ½ the onion, ½ the poblano, ½ the cilantro and nutritional yeast. Mix well. Place the corn tortillas flat on a clean work surface. Divide the filling between 8 tortillas. Tightly roll up each tortilla around the filling. Arrange the burritos on a lined sheet pan drizzled with oil, seam side down. Brush each burrito with oil and cook for 10 to 12 minutes, until golden brown. For the PICO DE GALLO: Mix the tomatoes, ½ the lime juice, cilantro and as much of the remaining onion and poblano as you’d like. Drizzle with oil and season with S&P to taste. For the LIME CREMA: Combine the yogurt, remaining lime juice, 1 tbsp of water and as much of the lime zest as you’d like; season with S&P to taste. 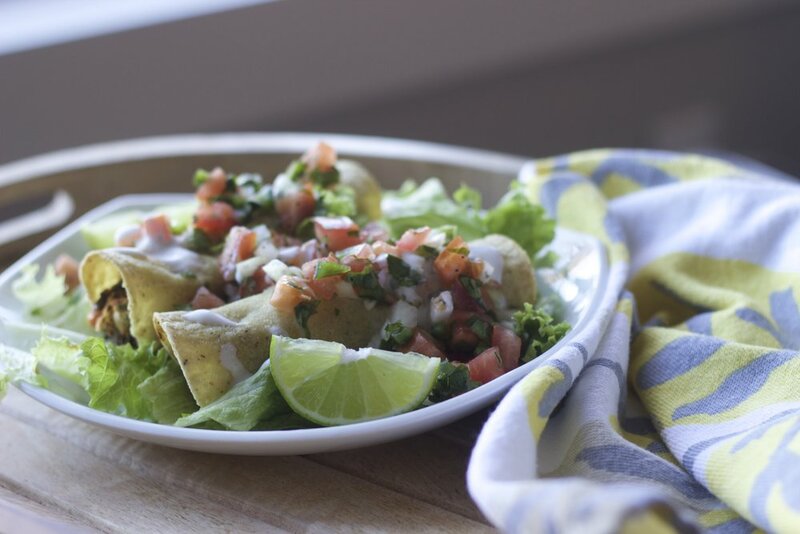 Create a bed of lettuce, place burritos on top and garnish with Pico De Gallo and a drizzle of lime crema. 1 Serving: 1 cup of lettuce, 2 burritos, 1/4 cup Pico De Gallo and drizzle of lime crema.